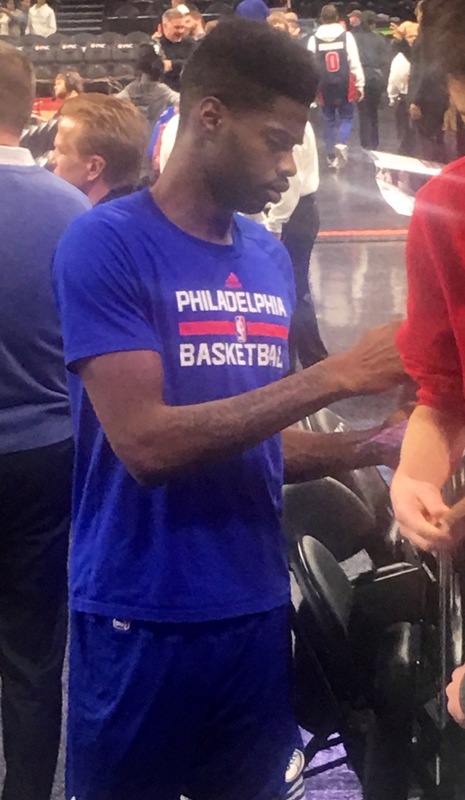 Here is an original photo of 76ers big man Nerlens Noel signing autographs. The picture was captured by iFolloSports.com Michigan based correspondent Lance Martinez, at the Palace of Auburn Hills, prior to a game against the Pistons. A Nerlens Noel autograph was in high demand on this day. Noel is in his second NBA season, after missing his entire rookie campaign (2013-2014) recovering from an ACL injury, suffered during his lone season at Kentucky. For his young career, Noel has largely flown under the radar with the abysmal 76ers, however, he is averaging a respectable 10.3 points and 8.0 rebounds, over the course of his 129 career games. Noel, a Massachusetts native, was originally drafted by the Pelicans, but was dealt to Philadelphia as part of a draft day trade.